Referee seminar, Tani sensei front far right. This past WKC seems to have generated more debate on the future of kendo than any previous championship. Whilst the results were fairly predictable, the closeness of the whole competition surprised many people. Numerous comments were made about supporter reaction, the defensive nature of the final and the inevitable discussion about refereeing decisions continues. In my previous two posts I touched on the fact that there is a general leveling of global kendo and I obviously defended my referee colleagues with the “it’s not perfect, but it’s the best we have” argument. I have however so far refrained from writing about my perceptions of team tactics. I for once allowed myself to get slightly bad tempered in responding to a point made on LinkedIn’s kendo forum, which stated that weight training has become the norm for those engaged in competitive kendo. This may or may not be true, but for it to be postulated online, supported only by second hand hearsay evidence, is ridiculous. Looking at some of the later stage shiai however, if I had to guess the coaches’ instructions, I would suggest that they were along the lines of “don’t lose”. One of the highlights of my week in Novara was being taken to pieces by Tani sensei in the referees’ keiko. Curious to see how he performed against bigger and better opponents, I resorted to YouTube to watch him in action in the finals and semi finals of this year’s All Japan 8th dan Championships. What I saw was very different to some of the kendo at the 15WKC. Shiai were conducted calmly in good distance with minimal time spent in tsubazeriai. When tsubazeri did occur, separation was instant and by mutual consent. Points were clean and clear and invariably graciously acknowledged. Perhaps at eighth dan there is recognition of the fact that you are a kendo role model and this is what keeps your shiai as an example of correct kendo. Having said that, there is value in betting that a number of the athletes who competed in the finals of this and previous WKC’s are sooner or later going to reach that exalted position. It would be interesting to put a time machine into fast forward to look at their future performances at hachidan level. I expect that we will see tachiai which are just as dignified as Tani sensei’s. Last week, I enjoyed a chat with Murakami sensei, one of the USA’s most experienced and respected kenshi, who made the point that European kendo, has improved radically since the 14WKC in Brazil. This is undoubtedly true! Countries relatively new to kendo such as Serbia and Montenegro, showed a remarkably high level of kendo for the limited time that they have been on the international kendo circuit. The more established European kendo groups including, Hungary, Italy, France and Germany just seem to get stronger and stronger and those in the middle of the experience scale have pulled themselves up several notches, with Ireland moving out of the pool rounds. Russian kendo has changed radically for the better, The Polish team looked good, but I think that Murakami sensei only got it partially right. The level of World Kendo has improved significantly! It is always a close thing between Japan and Korea, but now U.S.A, Canada and Brazil are only a hair’s breadth behind them and there is little distance between the top two and Taiwan. Australia and New Zealand produced some skilful, technically correct kendo, Mexico, Ecuador and Venezuela looked solid and the newer Asian kendo countries including Thailand seemed to have made remarkable progress. Most astonishing was The People’s Republic of China. This team suddenly appeared, looking as if it was born to kendo maturity. The general consensus amongst the people that I spoke to was that no-one would be surprised if in the near future the winners of The World Kendo Championships came from any part of the globe. Kendo is obviously improving exponentially. When I took part in the 3WKC in 1976, there were light-years distance between our kendo and that of the Japanese winners. What are the reasons behind this levelling of the playing field? Obviously FIK have continually sent coaches and delegations around the world. 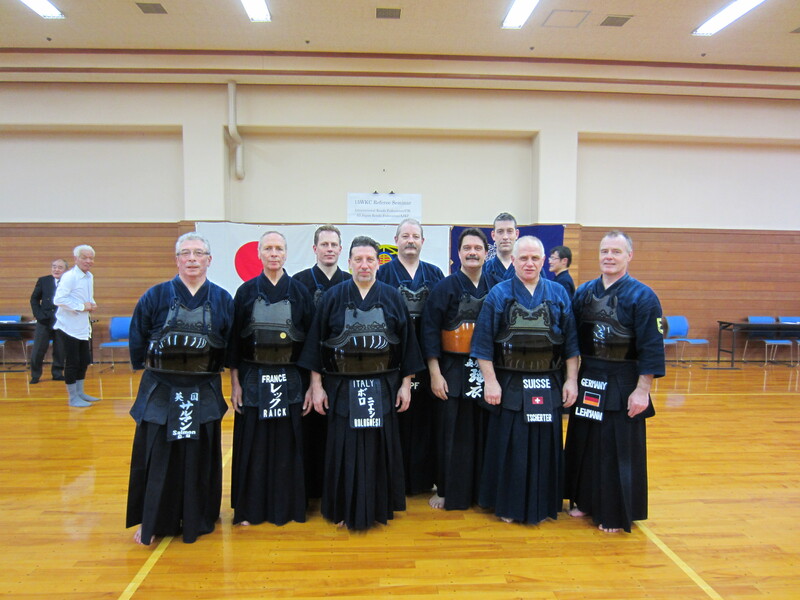 As kendo has matured, more and more people have made the effort to train and study in Japan or Korea and in many cases taken what they have learned home to share with their fellow kendoka. As in many other areas of our lives, new social media has also made a big impact. You can witness a competition in Japan five minutes later in Iceland – thanks to YouTube. Because of the ability to look at high-quality kendo online, it is hard to be satisfied with producing your own sub-standard version. I came away from the 15WKC with the impression that whilst the internationalisation of kendo brings with it the occasional challenge in managing fan behaviour. It is certainly making for more interesting, more even global competition. The 15WKC is over. 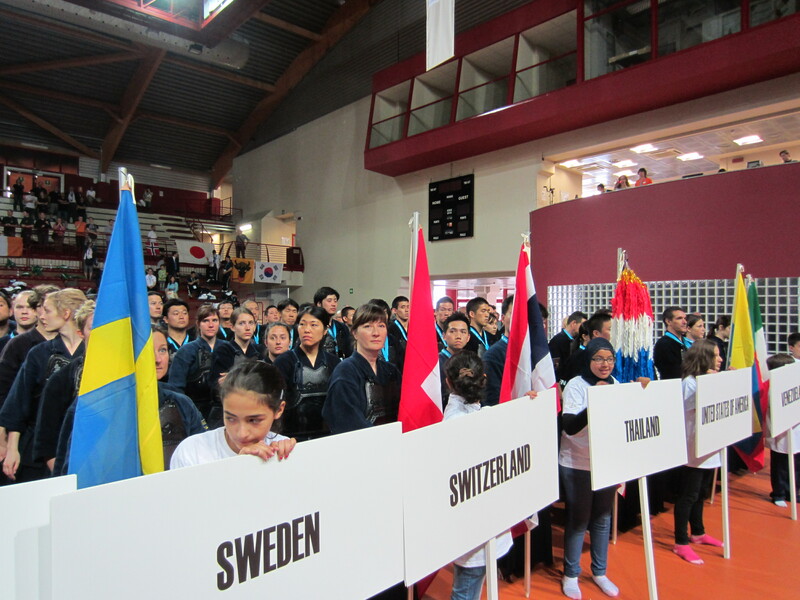 Kendo people from around the world are arriving home and sharing their impressions of the event with friends in their home countries. Athletes, coaches and supporters are still buzzing with euphoria or nursing their disappointment and starting to think about doing as well or better in Tokyo in 2015. After my first WKC as a referee, I came away with mixed feelings of exhaustion, relief that I have so far not been featured on the referee mistakes videos on Youtube and surprise that I got home with all my possessions and none of my room- mates after packing for the early morning airport bus, just hours after the sayonara party. For the referees it was a long week. We started with a referee seminar on Wednesday to reinforce the work we did in Japan in February and then spent three long days in the arena. On Saturday we arrived at 8.00 in the morning and got back to our nearby hotel at 9.00 at night. The activity was constant; I may be a potential candidate for the World Speed Eating prize, having demolished a four course Italian lunch in a 5 minute break. The referee team inhabited a parallel universe for the course of the championship. We were either in the shiai-jo or segregated in our own hotel and other than briefly socialising with each other over dinner and breakfast, did nothing apart from referee and sleep. Even amongst ourselves, there was no discussion on the accuracy of decisions made on court. At the two seminars prior to the competition, yuko datotsu were dissected in detail, but at the event, real time decisions are made in seconds, are incontestable; and further debate is irrelevant. I worked on Court A with a group of Korean, Japanese, Taiwanese, American and European colleagues. When we were sitting in the queue; we stole the occasional glance at the performances of our own countries’ teams but by and large, remained emotionally detached. When on court, everyone made their own series of split-second decisions with sincerity and without bias. My overall impression is that everyone gave their all and that the calls made in the centre of the arena under the scrutiny of the audience and the world’s media, were made to the best of our ability. It is easy to make judgments when you are nursing a cold drink in the back row of the stands, but slightly tougher when you are in the spotlight. There have been debates about electronic bogu and video evidence to decide ippon. When you take into account the elements of distance, posture, intention, sae, hasuji, attacking spirit and zanshin that are integral to yuko datotsu, there seems to be little alternative to the current system, human error included. It looks as if I will be back in Japan early in the New Year. I just heard that I have been included in the list of referees for The 15th World Kendo Championships and that we are required to attend a training camp in Narita in February and then a two day seminar in Novara, in Italy, just before the Championships. Reassuringly the International Kendo Federation go to this amount of effort to ensure that referees are trained to a consistent standard. Whilst we are the people in the background, if we get it wrong, we potentially can spoil the outcome of the entire competition. 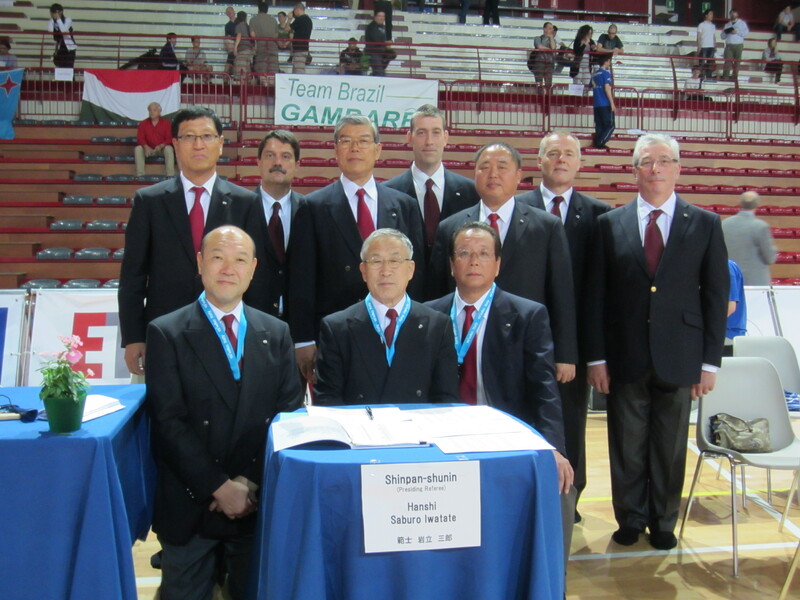 There will be 36 referees for the 15 WKC, drawn from FIK’s 3 zones – Asia, Americas and Europe. 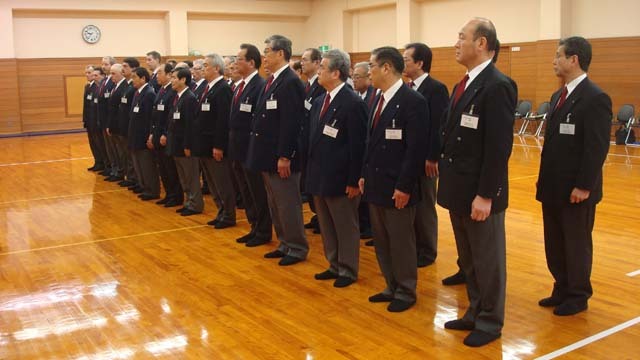 All are 7th or 8th dan and all have international refereeing experience. This year however, a number of us are new to the World Championships and whilst I know many of the other shinpan by name, I have never worked with them in a team. The smooth running and outcome of every competition depends on the accuracy of referees decisions. Not only does each individual have to deliver to the best of his ability, but the three referees on court at any given time, must work as a finely tuned team. FIK explains that the purpose of this pre-competition training is to harmonise the decision making process of the referee group. Kendo typically calls for mix of self reliance and the ability to work with others. We depend on each others’ support and cooperation in our dojo and within our own local kendo associations. This type of international event widens both our own level of obligation to play our part and our dependence on the bigger team. The referees group includes sensei from Brazil, Canada, Chinese Taipei, France, Finland, Germany, Italy, Japan, Korea, Sweden, Switzerland, U.K and U.S.A. Whilst I have been on court with most of my European colleagues before, it will be a new experience to work with many of the other participants. It is going to be an interesting challenge to get to know everyone and to learn how to become part of an integrated refereeing machine. Clearly the International Kendo Federation has risen to this challenge over the last 14 World Championships and has developed systems to get the best from us. It is now up to me and my new colleagues to prepare as hard as we can to deliver at the end of May.